The author caught this red grouper in the fall, when the popular bottomfish move closer to shore as the water cools. 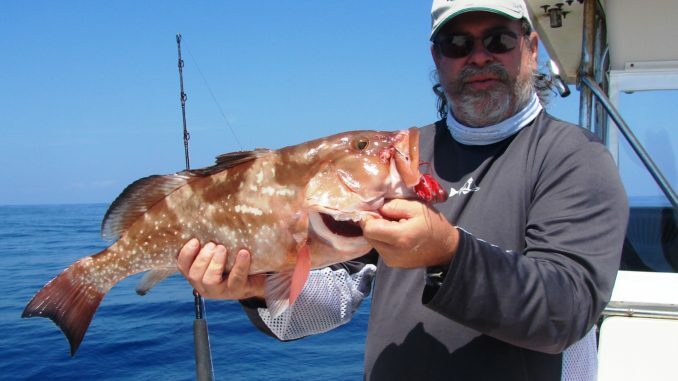 Grouper are as close to the beach as they’ll ever been in November, and this North Carolina captain has a few ideas about catching them. He honed his craft in many places, including Caribbean islands, Central American countries, Venezuela and Hawaii, but he returned to his home base and now runs Pelagic Hunter Sportfishing out of Swan Point Marina in Sneads Ferry, an Onslow County port that offers good bottom-fishing all the way from Cape Fear to Cape Lookout. Mallette said offshore fishing has the potential to be good all year, but he likes fall fishing the best. When the water begins to cool, fish get active and begin feeding aggressively. Gag and black grouper move inshore, but they can be really finicky and bite very subtly in the shallow water, and that makes them a challenge for inexperienced fishermen. However, experienced grouper fishermen can usually fill limits within sight of the higher buildings along the beach. Most grouper fishermen find them easier to catch in deeper water, generally 80 to 120 feet, and red grouper are also found at those depths. “Locating grouper takes practice,” Mallette said. “It’s easy to find the big rocks and wrecks that are loaded with fish, but those typically don’t hold a bunch of grouper. Those are mixed concentrations of beeliners, triggerfish, black sea bass, grunts, porgys and such. 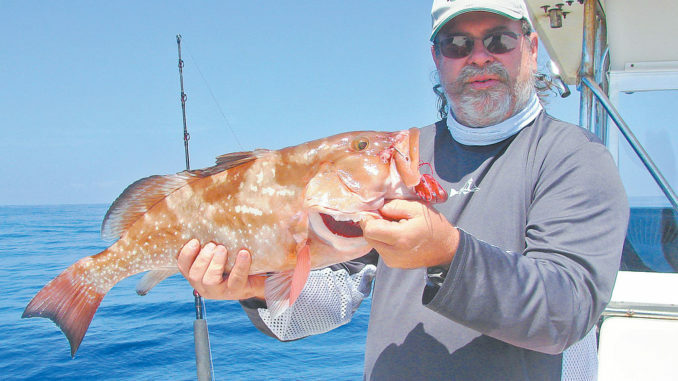 They’re fun to catch and taste pretty good, but there won’t be many grouper in the mix. Grouper would be difficult to catch, anyway, as the smaller fish are more aggressive and tear up baits before grouper move to them. “I look for smaller rocks or other places with low relief that are harder to find,” Mallette said. “Grouper are right on the bottom and don’t mark well. Sometimes, they’re just a couple of pixels on your scope, and sometimes they don’t mark at all. You’ve got to have faith in your spot. Mallette said anchoring is the most important part of grouper fishing. Once that perfect rock is located, you must get anchored so your baits drop to the fish, and it’s more difficult than it seems. You drop the anchor in sand away from the rock, and wind and current push the boat back over the rock. The direction to move away from the rock to anchor over it is called the anchor course. “Many new grouper fishermen don’t understand the importance of finding the anchor course and getting anchored properly,” Mallette said. “It’s like bream fishing when they are on a bed. The fishing is hot and heavy when your bait drops down to the bed, but being only a foot or two off doesn’t get bites. “You can adjust your position fore and aft by shortening or lengthening the anchor line, but if you’re off to the side, you must refigure the anchor course and anchor again. Some days, wind is all you have to deal with, and getting anchored is pretty easy. However, some days there is current, and getting anchored just right is harder. Once positioned above the fish, Mallette likes to drop natural baits to them. He also carries a couple of rods rigged for jigging but admits he rarely uses them. For bait, Mallette uses lots of Spanish sardines, cigar minnows and Boston mackerel. He has a progression he follows, beginning with fresh or thawed sardines hooked in the head, either up through both jaws or through the eyes. If the bite slows, he starts hooking some baits in the tail. If this doesn’t work or the bite slows again, he switches to frozen sardines or cigar minnows. After this, he switches to Boston mackerel, then to chunks of meat and finally, to menhaden, spots and bluefish. Mallette said not to use menhaden for grouper except as a last resort. He said they will sometimes catch a few more fish, but they attract ringtails. Once ringtails move in, you might catch some of the other species, but they get aggressive and will tear up your baits before grouper can to eat them. After going through this progression, Mallette moves to another rock. HOW TO GET THERE — Sneads Ferry is most-easily accessed via NC 210 or NC 172 from US 17 between Wilmington and Jacksonville. Catch US 17 in New Bern and head south, or take I-40 to NC 24 to US 17. Popular public boat ramps are Fulcher’s Landing in Sneads Ferry and under the NC 210 bridge at North Topsail Beach. WHEN TO GO — Grouper fishing is open from May 1-Jan. 1, and the fishing really picks up in the fall when cooling water moves fish closer to the beach. TACKLE/TECHNIQUES — Rods for grouper need a soft tip to feel subtle strikes but enough backbone to lift a fish off the bottom. Tuna sticks in 51/2- to 61/2-foot lengths in 50- to 80-pound class are popular. Penn Senator reels in 4/0 to 6/0 sizes are long-time favorites. A good drag system is important. Reels should be filled with 80-pound braid with a topshot of around 30 feet of 130-pound monofilament. Single- and double-hook bottom rigs are common, with baits including Spanish sardines, cigar minnows and Boston mackerel. Jigging is less common, but 6- to 8-ounce diamond jigs are the ticket. 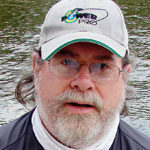 FISHING INFO/GUIDES — John Mallette, Pelagic Hunter Sportfishing, 910-934-2628, www.carolinaoffshorefishing.com; New River Marina, 910-327-2106, www.newrivermarina.com. See also Guides and Charters in Classifieds. ACCOMMODATIONS — Quality Inn & Suites, 910-327-8282; Topsail Shores Inn, 910-685-0969; Seaview Motel, 910-328-3172; Onslow County Tourism Office, www.onslowcountytourism.com. MAPS — Capt. Segull’s Nautical Charts, 888-473-4855, www.captainsegullcharts.com; Sealake Fishing Guides, 800-411-0185, www.thegoodspots.com; Maps Unique, 910-458-9923, www.mapsunique.com; Grease Chart, 800-326-3567, www.greasechart.com; GMCO’s Chartbook of North Carolina, 888-420-6277, www.gmcomaps.com.